S A Azad, coordinator of People's Rights and Social Research Centre (prasar) came to Lal Kuan village in the outskirts of Delhi in 1999 with a specific task in mind: making the villagers literate. In due course, he noticed a pattern: despite getting repeatedly treated for tuberculosis, villagers would die. Today, he can talk of nothing else but this problem and the dead ends he has reached trying to help the people. 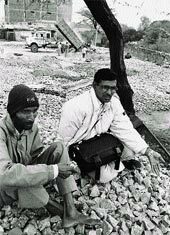 He stops passing-by Budh Ram: this 37 year-old migrant from Rajasthan began work 20 years ago; a casual labourer, he worked around stone-crushing machines. About 10 years ago, he developed a breathing affliction and was treated for tuberculosis (tb) by the government tb dispensary in Nehru Nagar. This did not help; nor did treatment by mobile medical teams. Budh Ram became a truck driver, but fell ill once again four years ago. The tb drugs helped him for a year, but he has been deteriorating since. It isn't TB Says Budh Ram, "The medicines are not working. I cannot even walk." "Isn't it obvious that if three to four courses of tb medicines are not helping; the problem is not likely to be tb?" asks Azad. According to him, what affects Budh Ram is silicosis, common enough in the area's stone mining community. As silicosis cannot be cured, workers are generally given compensation. But authorities want proof that a workers indeed has silicosis, before stepping in with treatment. This leads to a catch-22 situation: while Azad collects information, mineworkers die, supposedly from tb. In 1980 an All India Institute of Medical Sciences, Delhi, study had shown that silicosis was common in the Lal Kuan area. In 2001, prasar carried out a study; 146 people were interviewed and the result suggested that 83 of them could be silicosis-ridden. Confirmatory tests were needed then. While silicosis can be diagnosed on the basis of history and a simple x-ray, additional tests need to be done to ensure results cannot be nullified in court. A ct scan is required, but costs Rs 4,000, and even government hospitals do not provide it gratis. Indeed, Azad couldn't find a single hospital willing to waive off ct scan charges. Finally, the Lala Ram Sarup Institute -- it treats tuberculosis and other respiratory diseases -- in Mehrauli agreed to test 25 people. So far, only five cases of silicosis have been confirmed, Budh Ram among them. For the rest, the confirmatory test could not be carried out as they have silico-tuberculosis and the test can be done only when tb is controlled. Also, a petition filed in June 2003 by prasar and three other non-governmental organisations -- Delhi Forum, Toxic links and Environmental Justice Initiative -- along with the National Human Rights Commission (nhrc) has also reached a dead end. nhrc sent a copy of the complaint to the Secretaries of health, labour and industry, the labour commissioner, the Delhi government and its pollution control department. The complaint letter is dated 19th August, 2003; no one has responded. Doctors least bothered Even more disturbing, the medical fraternity is not bothered to find out why the same people are put on tb drugs, again and again. "The tb control programme anyway does not have a role if the disease is silicosis, and the patient will be referred to a specialist," says J N Banavaliker, head, department of tb and respiratory diseases, tb Control Office, Gulabi Bagh, Delhi. He says the department has never been informed of the silicosis problem in the area. The Lala Ram Sarup Institute regularly receives silicosis patients, but there is no mechanism to report these cases. "The tb doctors are just not willing to listen to the patients -- all they are interested in is meeting targets," says Azad. "It seems the whole procedure is being made prohibitive under pressure, so that compensation does not have to be given," says Souparna Lahiri, coordinator, Delhi Forum. How should this problem be resolved? The quarrying business should be regulated, says Lahiri. Government funding could help create a database on the problem, feels Anand Jaiswal, chest physician at the Lala Ram Sarup Institute. Meanwhile, there's no respite for mineworkers.